So it looks like a small town mayor and his utilities manager picked the wrong bees nest to throw a rock at, and are now learning things the hard way via the World Wide Web (social media). 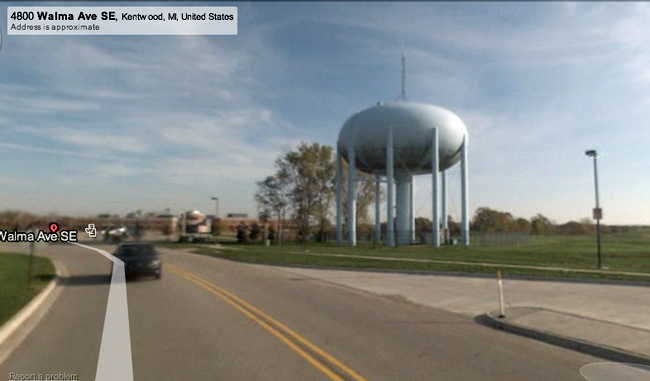 If you haven’t heard yet, Ed Heil, a 40-year-old amateur photographer (terrorist), was caught last week photographing the City of Kentwood’s water tower (“high profile terrorist target”). His “nerdy” hobby (suspicious activity) brought the wrath of the city’s utility workers (vigilantes) who followed Heil all the way to the library (terrorist hideout) where they harassed and threatened him until he finally caved in and gave up his name to these “brave patriots” (self-anointed assholes). Mayor Richard Root said no one takes chances any more. He said he was proud of city workers for their diligence, adding that they responded appropriately. Long story short—everybody on the internet (especially photographers) who can think clearly and see right through the last decade of terrorism hysteria and Homeland Security (Theater), are rightfully annoyed. But not JDnew (see the comment he left on our original post). So a group of photographers (al-Qaeda sympathizers) from the Grand Rapids, Michigan, flickr group are organizing a photowalk (recon mission) this week to show Mayor Root and the town’s utilities manager, John Gorney, that they can’t push photographers around and get away with it. To get in on the action, click here. To read our original post about Ed Heil, go here. Now, most logically thinking people would gather that the City of Kentwood, MI, is the last place on Google Maps that terrorists would target. But if you make the mistake of photographing Kentwood’s “octopus” water tower (which of course, is featured on Kentwood’s website, Google street view, and within eyeshot of Kentwood’s police and fire stations), then you will likely be harassed, threatened and followed until you are forced into providing your name to a group of people who have no authority to order anybody to do anything. 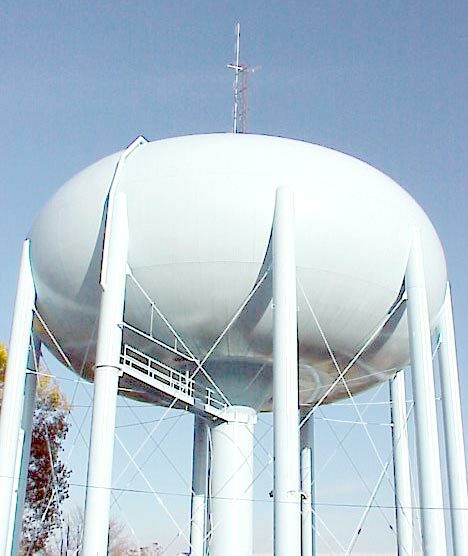 It all started when 40-year-old computer programmer and photo hobbyist, Ed Heil, was minding his own business and decided to photograph the water tower located on Walma Avenue SE, but instead, attracted the attention of Kentwood’s finest—its city utility workers—who wanted to know Heil’s name and why he was taking pictures of the tower. Heil said he just wanted to be left alone Thursday afternoon. If police asked, he would talk; but he didn’t think he had to answer to city workers. Heil’s position was correct, but the interrogation didn’t cease. And even though the water tower is within view of the police station, the utility workers chose not to involve the police, but decided to take matters into their own hands and go beyond their non-existent authority and continue to harass Heil, following him to the library — where they prevented Heil from working and ultimately bullied him into providing them with his name. Real heroes, right? A mayor would be so proud. In most situations, when something raises a concern, i. e., real suspicious people or real potential terrorist attacks, most logically thinking people would contact law enforcement to handle the situation. But that is not what happened in Kentwood and the city’s vigilantes believed that they had the legal authority to handle the situation the way they wanted to handle it. So Mayor Richard Root and John Gorney, Kentwood’s operations and utilities manager (who was summoned to the scene), are justifying the utility workers’ harassment of Heil by using—you guessed it—terrorism as the rationale. Which, nowadays, is standard operating procedure involving these kinds of incidences. Since we all know in these hyped-up times of synthetic threats and manufactured fear, “terrorism” and “homeland security” are used to condone all kinds of illegal and questionable behavior that is carried out by our federal, state and the smallest of local governments. But Mayor Richard Root said no one takes chances any more. More important, Root, in an attempt to support his position and create some sort of false threat of terrorism in the City of Kentwood (I’m curious to know when Root is up for re-election), equates Kentwood’s water tower to Michigan’s Mackinac Bridge (ironically, and contrary to Root’s presumptions, the bridge’s own website has a photo gallery). So we’re supposed to believe that the third longest suspension bridge in the United States and it’s likelihood of being attacked by terrorists is equivalent to a water tower in a small city located in the southeastern part of Michigan with a population of 45,000? He said he was proud of city workers for their diligence, adding that they responded appropriately. And just so you know Mayor Root, but I already think you do, as one of Michigan’s major tourist attractions, the Mackinac Bridge is photographed by people every day (try a simple Google search) and the Coast Guard does not harass these people for performing an activity that is protected by the First Amendment. …the incident would be referred to U.S. Department of Homeland Security. I wonder if the The Department of Homeland Security (Theater) is tired of receiving ridiculous reports like this, or if they have paranoid morons working for them too.